Wow, I haven’t updated this blog in months! It’s been crazy with work and a newly adopted dog, but I still try to cook and bake when I can…so here’s a new one for ya! For a lot of people, winter/the holidays is eggnog season — not so much for my family! I had eggnog for the first time 2 years ago when a friend made some, but I got a carton as a gift from Organic Valley for the holidays. I was pleasantly surprised to find out that it was actually delicious! I don’t drink milk that often anymore unless it’s in my coffee, so I wasn’t sure what to do with the whole carton before the expiration date. And in came this idea for a cake. I added extra spices to enhance the nutmeg flavor in the eggnog, and I also used almond flour…because I didn’t have all-purpose flour at the time 🙃 Attempt #1 did not work so this recipe is attempt #2 with some all-purpose flour mixed in for more stability! Mix the butter and sugars together until well blended. While the mixer is going, add in the egg and vanilla extract. Mix until everything is incorporated and then stop your mixer. In a separate bowl, whisk together the flours, spices, baking soda, baking powder, and salt. Turn the mixer back on and alternate adding in the flour mix and the eggnog. Spray an 8x8 baking tray with some baking spray and pour the batter in. Bake for 50-60 minutes until a toothpick comes out clean. Let your cake cool and mix your icing. I would start off with whisking the eggnog in bit by bit until the icing is the consistency that you want. It should be slightly runny but not too thin or it will soak into your cake. 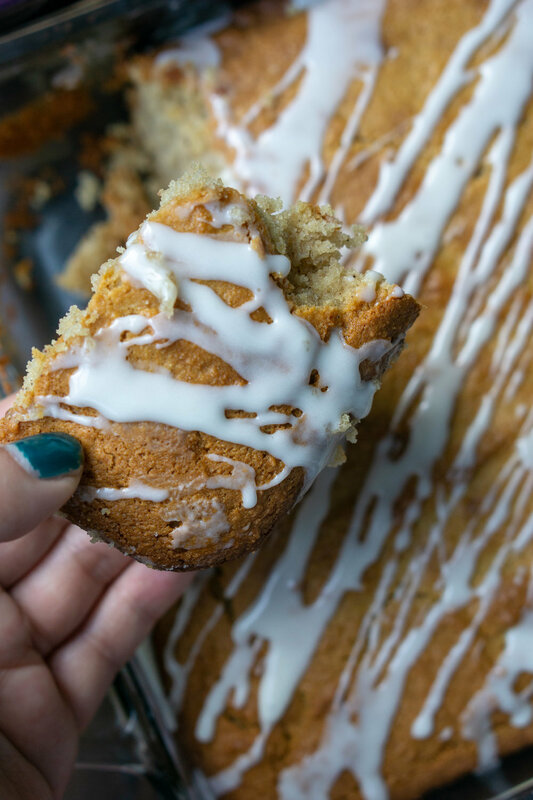 Once the cake is cooled, drizzle the icing on top…or just pour it on! The almond flour and all-purpose mixed together will create a denser crumb, so this cake is pretty thick!